Technology can help transform learning, but as numerous studies have shown, more technology in the classroom doesn’t automatically equate with better results. Most notably the Or ganization for Economic Co-operation and Development (OECD) and John Hattie, Director of the Melbourne Educational Research Institute have raised concerns that education spending does not equate to better outcomes. Getting the conditions right is vital for the success of today’s learners and teachers. The leaders of Curl Curl North Public School learned at the Inspiring Greatness Conference this past fall about recent SMART commissioned global research. This research includes a synthesis of technology best practices from agencies such as ISTE, the European Digital Competencies, UNESCO, and CASEL, and from this identified 22 EdTech Capabilities. Learn more about this research and the hundreds of respondents whose data has led to the creation of the first edition of a whitepaper based on the link between advancement in these 22 capabilities and education outcomes here. Schools whose leaders indicated high outcomes also reported higher development in all 22 EdTech capabilities, but especially those related to strategic and collaborative technology planning. Interestingly not all EdTech capabilities showed an equal impact on outcomes. Some capabilities were more strongly correlated to better outcomes. In Australia as well as globally, survey respondents in the study who reported a high stage of development in EdTech capabilities were more likely to indicate increases in student achievement, improved school performance, high teacher satisfaction and advanced student readiness and digital competencies. Conversely leaders who reported less developed EdTech capabilities indicated lower levels of success in these outcomes. The 27% of Australian schools who reported higher learning outcomes prioritized the 22 capabilities very differently from the 22% of schools who reported low outcomes. 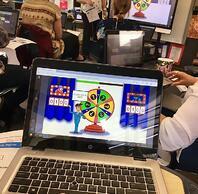 The two groups of schools also showed different approaches to their technology mix, with the high outcomes group favoring technologies that promote progressive student-centered pedagogies. The results confirming a 2016 study showing that technology drives better learning outcomes when it is chosen to complement defined teaching practices. 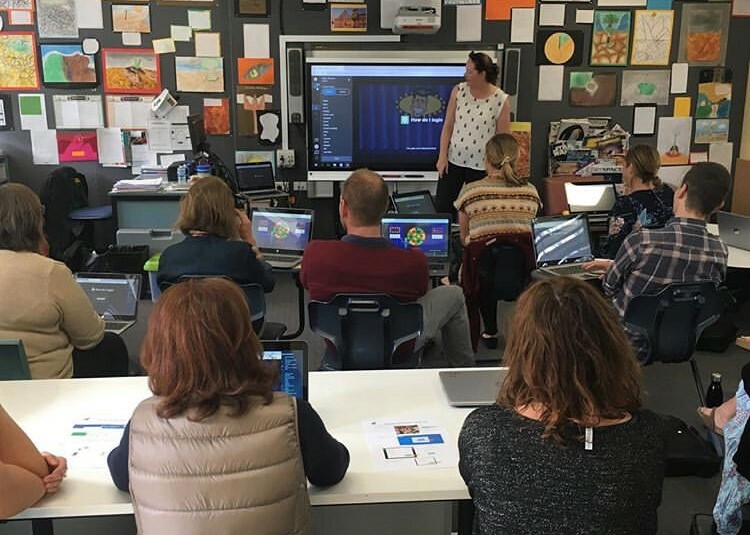 School leaders from Curl Curl North presented the 22 EdTech Capabilities to their staff and ask them to complete their own profiles after learning about this research in the fall. 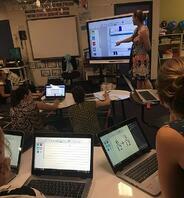 Over the summer break, leaders and educators, including SMART Exemplary Educators Rebecca Boyle, Gretel Watson and their Principal Donna Blatchford had the chance to participate in workshops about the 22 capabilities at LearnIt and Bett in London, UK. As the school term began in 2019 a whole school profile had been developed and sent to the leadership team. The profile indicated their strengths and three areas for action, with leaders noting that the advice and feedback they received on their personalized profile them clear goals for their next year. The school is currently undergoing a massive refurbishment under the NSW DoE Future Schools Project and the EdTech Capabilities align well with the Future Focused learning strategies especially dispositions of learning and creating and designing learning spaces. 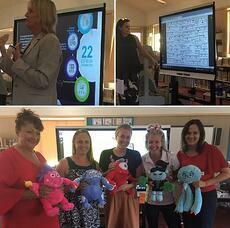 Recently, personnel from the SMART ANZ Team presented the results of the whole school profile to the staff at Curl Curl. A key school executive then demonstrated strategies which the staff could implement to address one of the key areas of action: Support for Social and Emotional Learning. The school has been working to develop these skills in their students across the curricula but not necessarily in an explicit way – this new focus is an exciting new development in an area of key focus in education globally. Utilizing SMART Learning Suite and the SMART Monsters, Curl Curl teachers intend to make key Social and Emotional Learning skills explicit to students in their teaching an d to have students reflect on their own SEL skills by identifying them using the monster characters. Did you know that each SMART Monster has their own greatness – an SEL skills set that they’re particularity great at? Learn more here. 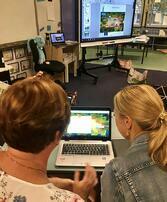 These are exciting times for the staff at Curl Curl North on their journey to enhance their EdTech Capabilities! Stay tuned to learn more about their journey and outcomes. Add your voice to the dialogue and take the survey at www.smarttech.com/profile or email 22capabilities@smarttech.com to connect with the global team. Connect with author Sue directly about the research or anything ANZ education by emailing: SueBeveridge@smarttech.com.